Notable as much for being the shortest Jesu album to date at just over 42 minutes' length as anything, Every Day I Get Closer to the Light From Which I Came is by some distance the lightest and most ethereal, too. 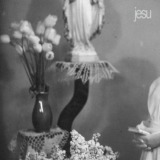 Influenced apparently by Justin Broadrick's recent entry into the bleak domain of fatherhood, this is as distinctly beautiful as you'd expect from Jesu. Yet without the earthy sorrow of the likes of 2011's Ascension holding it down, it's also airy and joyous in an exhausted, kept-up-all-night sort of fashion. Ascension offered little serious threat to the listener, yet still retained some of his signature sadness and had plenty of post-Godfleshian riffage – in contrast, Every Day I Get Closer... is stripped back almost completely. Opener Homesick is the closest thing to typical Jesu that we know, programmed drumbeats and downtuned riffs present and correct, but the backing melody and vocals are much more direct, taking precedence as the track progresses and although the riffs never fade completely, you know that they're not what you're supposed to be concentrating on. The following Comforter and Everyday take this even further, the former especially having a Sigur Rós-meets-recent-Anathema vibe with snippets of vocals atop a smooth layer of guitar noise that's often almost covered completely with keyboards and vocals. It's barely recognisable as a song structurally, so much as an explosion of emotion. Everyday, meanwhile, is a simple, almost childlike song, a chimed melody over an uncomplicated beat, a lullaby of sorts and a palate-cleanser before the album centrepiece, the seventeen-minute The Great Leveller. This is the longest Jesu piece since 2009's Infinity, and it's excellent, featuring genuine orchestration provided by multi-instrumentalist Nicola Manzan. Opening with post-rock melody and gradually introducing percussion, the song changes a little when the usual heavy riffs are introduced, taking on more of an ominous tone which is lost as soon as the riffs go. The song actually suffers a little for the riffs – cutting it into the separate sections and allowing each to stand on its own may have worked better, especially as the sheer beauty of it is considerable. Allowing the riffs to return towards the end makes for a slightly more melancholic tone, one that continues into the final song Grey is the Colour, continuing Everyday's simpler approach with another touch of strings. It's a pleasant closing to a pleasant album, an album that's not without its flaws but an album that charms and beguiles. Perhaps those who have experienced fatherhood will react to it differently; as far as being a Jesu fan goes, this is a more than solid album to add to your collection, showing that Broadrick's hits are still outweighing his misses even as Jesu approaches its tenth year of existence. It's no Conqueror, however, and those looking for a release up to that album's quality will have to wait longer.